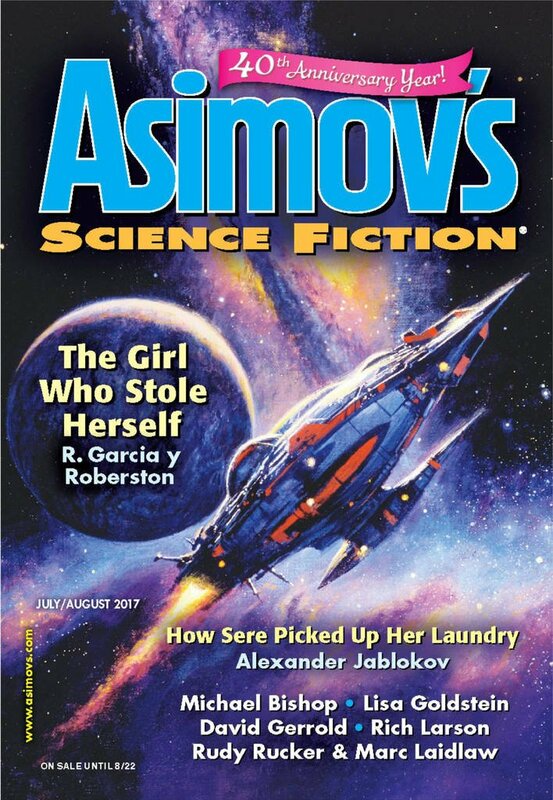 "Annabelle, Annie," by Lisa Goldstein [bio] (edited by Sheila Williams), appeared in Asimov's Science Fiction issue 07-08|17, published on June 15, 2017 by Penny Publications. Pro: The story does a good job of depicting the parent-teen conflict. Con: Annie is a rude, disrespectful, inconsiderate know-it-all. Her parents look bad for failing to control her. The story is unsatisfying because Annie ends up paying no real cost (that we can see), and her parents have decided she was right all along—even though her actions have impoverished their family and done no measurable good. I think that while the mother is the POV, Annie's meant to win our sympathy pretty early on. I think it's meant to be obvious that Annie's rude, but right -- and that staunch persistence, taking problems seriously, and taking responsibility for the consequences of your action are the only way we might possibly save ourselves. I think you're right about "doing no measurable good," but that's kind of beside the point. (Part of the point is, the world's too messed up for any quick action to do any measurable good.) The point is to stop ignoring urgent problems -- and maybe to paint a younger, savvier generation as our best hope for the future, even if that comes in a different and less pleasant way than we might expect. It's difficult to say what the point is. When you have a character who's as obnoxious as Annie, it's reasonable to expect to see her taken down a notch. When she's so disrespectful and contemptuous of her parents, you expect her to end up learning that her parents actually do know a thing or two. In this story, though, Annie never learns anything. Even though she herself will suffer for her actions, she seems oblivious to it all the way to the end. I think the whole point is that it's the other way around -- it's the parents who end up learning a thing or two. In other words, it's exactly the reverse of what you're saying -- Annie's obnoxiousness looks like the story's core conflict, but the actual core conflict is people being willing to ignore crucial problems because they find them uncomfortable or obnoxious. Getting over our kneejerk distaste for being criticized is what the story's about.